Jan 1-21: Spent a week with septic problems, followed by being sick with whatever's going round for another week so I haven't done much. I did manage to weld up the base for the Firewood Thwacker and got a coat of primer on it yesterday, just before the rains returned. Looks like we're in for a week of it so da plan is to spend as much of it as I can in front of the fireplace. Instead of the usual, this month I've consolidated my fairly spread-out work on the Mini Calliope..
Let me start with information regarding ideas, plans and software that I've found useful. About half of my work is based on an article penned by the late, great LBSC in the October '62 edition of Model Engineer, entitled "A Steam Calliopette". 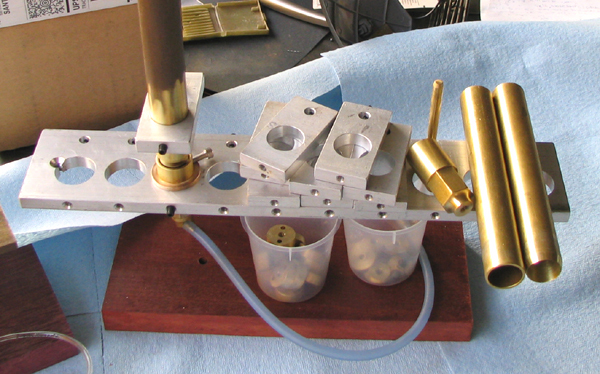 I noodled the other 'half' from Basic Hooter Whistle, an excellent description which includes operating parameters and equations. Once whistles were made I had to tune 'em! I downloaded and tried several chromatic tuners, but, although a PAIN to register, Chromatia had by far the most useful display. My contraption isn't breaking a lot of new ground, aside from its small size. Still there don't seem to be heaps of these things around! Here's a link to a useful description of one called the Fire Organ. Photo #1: I've posted this photo elsewhere, but here it is again, this time as 'chapter one' of a complete story. 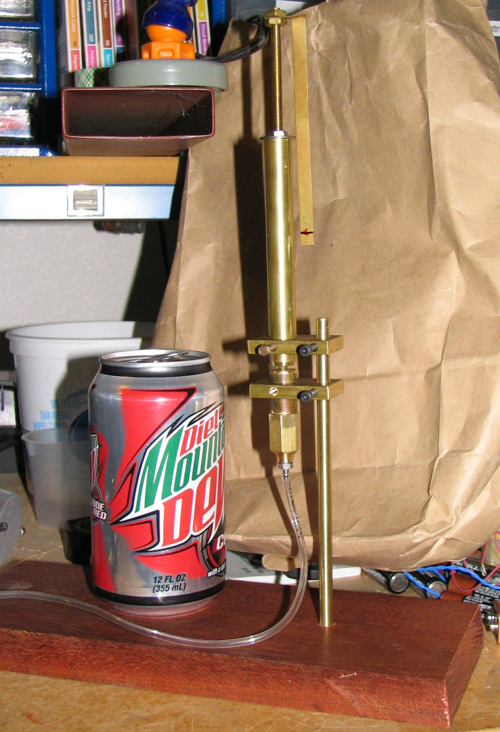 Here's the prototype "Helmholtz Resonator" I made, to demonstrate to my satisfaction that I could, indeed, scratchbuild a whistle that toots. The brass 'tubing' is actually pipe; i.e. 0.50"o.d. and 0.40"i.d. with a thicker wall than the stuff K&S sells thru hobby shops. Photo #2: Closeup of the business end of the resonator. 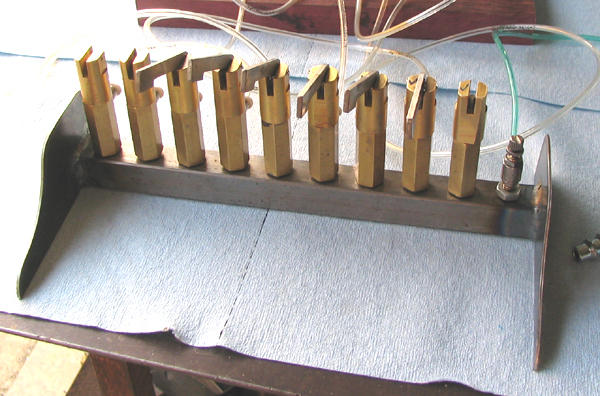 The bottom end of the top tube has a bevel, but the top end of the bottom tube is cut square. The reflection of the upper taper makes the bottom one appear to have a matching taper but it doesn't. There's a breakdown of all the elements that make up the innards in Photo #8. 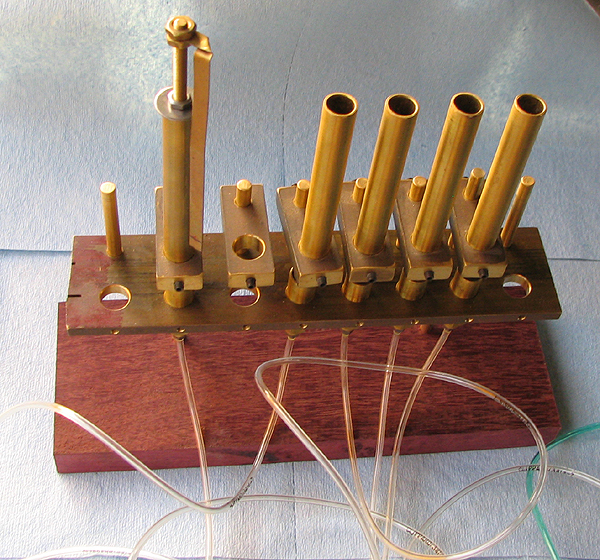 Photo #3: Once I had one working I made a set to complete a rudimentary 'octave' of 8 whistles. Note my 'slide whistle' contraption on the left. 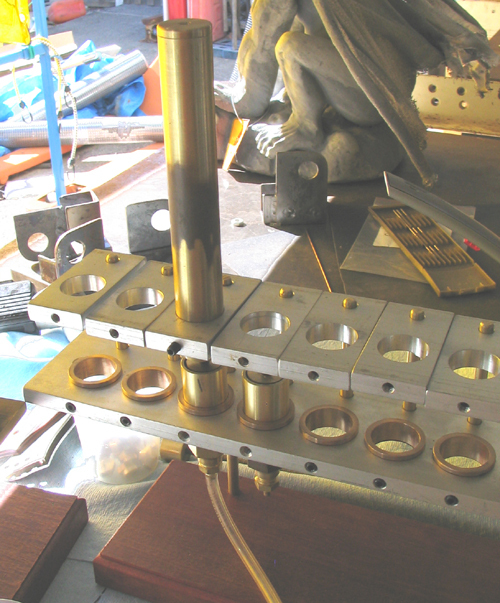 Da plan was to use this to tune each pipe individually, then cut and cap each at an appropriate length. But I found that it was very difficult to get a complete octave of notes. I suspect the diameter of the tube was restricting my tonal reach. Or maybe it's my total lack of any musical ability, heh. Photo #4: A calliope needs a keyboard so here's my pseudo-steampunky version. 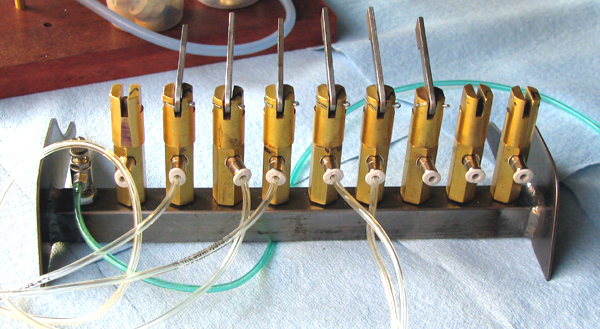 Turns out these key-valve assemblies were a royal PITA to get working reliably. I've since discovered an off-the-shelf Clippard MAV-2 poppet valve does the same thing for $6.69 and, wallet permitting, I can eventually buy all I need. Photo #5: Opposite side of keyboard. 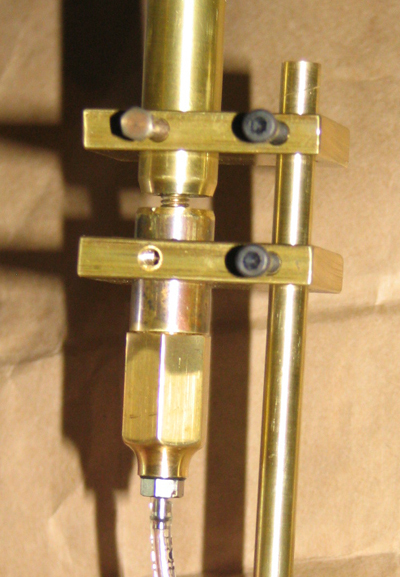 Note addition of quick-connect fittings. These are tremendous timesavers, particularly at this stage of the project. Eventually they'll be replaced with either hard-soldered or Swageloc fittings that are pressure resistant and (propane) gas-tight. Photo #6: OK so I got the little manual prototype to work, more or less. I decided to scale it up a bit to try and get more musical range. This scale of pipe meant that I could attach fittings large enough to flow propane at the rate needed to put on a bit of a show. These whistles are 7/8"o.d., 3/4"i.d. and the longest is about 18" tall. Photo #7: A little further along on the scaled up version with workbench filling up with various small bits needed to make enough whistles to carry a tune. Photo #8: Assembly on the left is called a foot. Within it are a series of widgets. I'll call the one second from the left a post support. 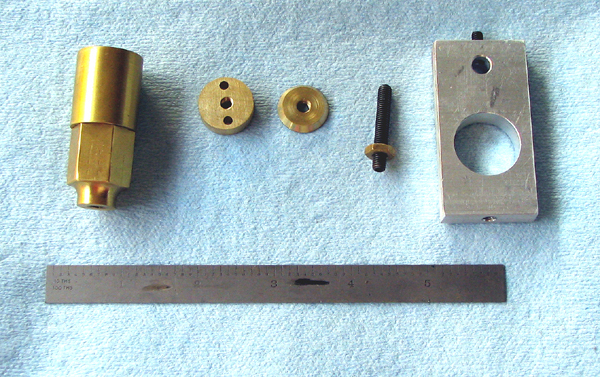 The third one is indeed called a languid and the bit of #10-32 allthread is called the post The aluminum piece on the far right is a nameless part I use to support a length of brass pipe, aka a bell, above the foot. Increasing diameter also meant all components were much easier to machine: if one rolled off of the workbench they were large enough to find, heh. 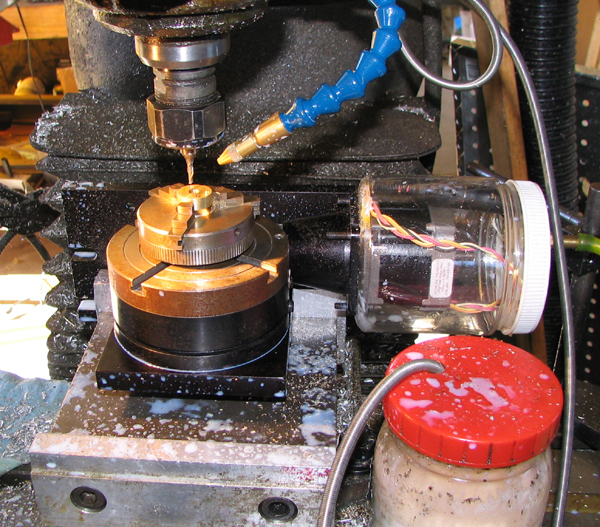 Photo #9: Lathe setup to machine a few post supports. 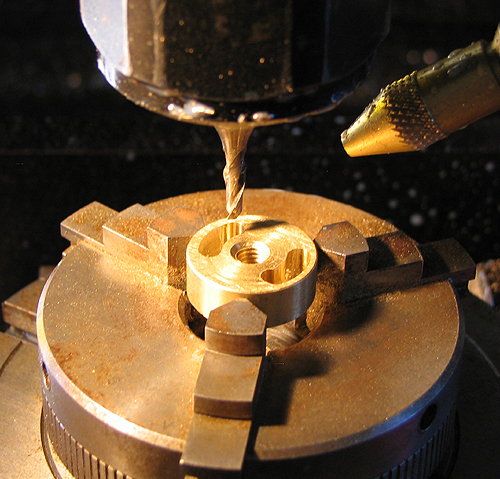 The real problem was maintaining concentricity with the threaded bore. If I had it to do over I'd press an unthreaded end of the post into a reamed hole in the post support, to better control squareness and concentricity. Photo #10: Last step in making the post support: cut holes for air or propane to pass thru it on its way to the flue. I thought drilled holes would have insufficient surface area, so I got out my modified (to be waterproof) Sherline CNC rotary table and had a go. Photo #11: For once a decent, in-focus close-up photo of the 3/4" dia. post support, now sporting a pair of milled air passages. Each is 3/16" wide and covers an arc of 60 degrees. 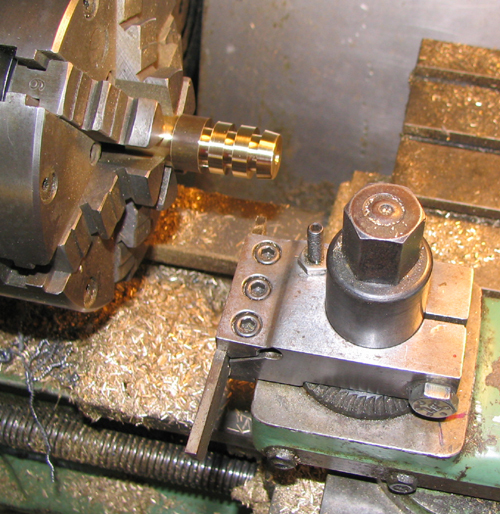 Photo #12: Approaching burn-out here; workbench a bit chaotic but most of the machining complete at this stage. Top left: original version; below it the keyboard. Top right: the larger scale contraption. 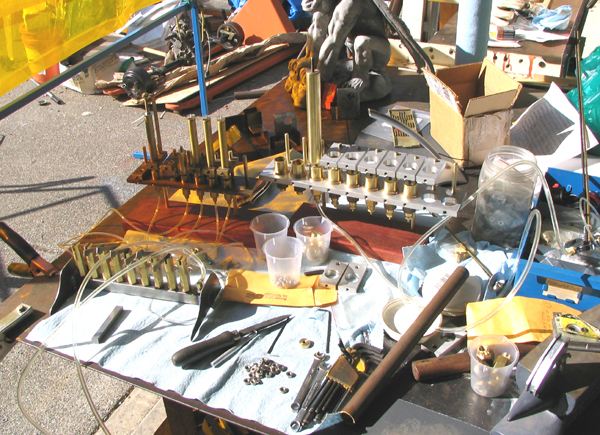 Foreground: piles of necessary components, tooling, etc. Next up: snag some solenoid valves and work on electronics and remembering how to program my Basic Stamp. Oh, and find the top of the workbench! When I burned out on the calliope project, somewhere back in the mists of time, I shifted gears and took a whack at "baking" something I'd posted to the Half Bakery a while back, namely the Dog Jack. Photo #13: Well here it is, in all its glory. 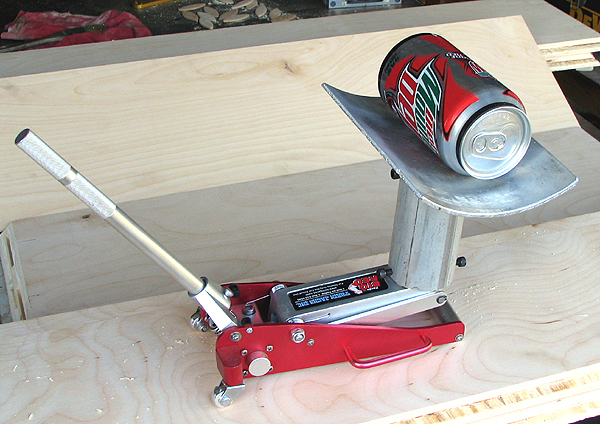 The thing exists because there's this very neat 'toy' floor jack made by Big Red. Some toy: it's got a rated load capacity of 200 pounds! Only cost me $19.-, too.. I added the spacer and the 'saddle' and it was good to go. Turns out it works best as a forearm fulcrum, so that I can lift a doggie with my hand, to minimize squirming. It's definitely a back saver tho and being as that was the intent I've deemed it a success!.